If you are looking for information on the Charley's Grilled Subs franchise business opportunity, Charley's Subs franchises or Charley's franchising, then you have come to the right place. Company president and CEO Charley Shin opened his first restaurant in 1986 on the campus of The Ohio State University in Columbus, Ohio. Now over 20 years later his "really good" sandwich shop has grown to over 300 franchise units across 38 United States and in seven countries worldwide. Charley now has formed a team of professionals targeting leadership in both brand equity and store expansion within the Sub-sandwich niche of the Fast Casual Restaurant sector. With a national trend toward more healthful eating, grilled foods are rapidly gaining popularity over fried foods. Charley's menu specialties feature nutritionally beneficial foods, including made-to-order grilled steak or chicken sandwiches and fresh-cut gourmet fries, as well as freshly squeezed lemonades and a variety of fresh salads and soups - therefore offering today's health-conscious and yet taste-loving consumers a better alternative to the higher-calorie and fat-laden menu offerings of most competitors. In over 20 years of doing business, Charley's has been recognized at the "top" of numberous lists for successful franchising, entrepreneurship and management. A key strength of our operation is the ongoing franchisee support provided by our professional management team and our productive programs. 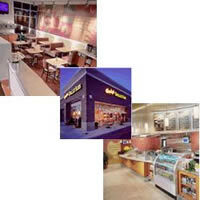 As one franchisee stated, "This is the best business opportunity out there. The team at Charley's consistently develops products that taste best -- and then they provide the training and expertise to make it and serve it consistently the right way." At Charley's our mission is to be America's Best "Fast Casual" restaurant chain; our pledge is to provide Charley's entire franchise family with the most winning business formula in the industry. Fast Casual sandwich concepts, positioned between fast food and sit-down restaurants, are growing at an annual double digit rate, more than double the rate of any other restaurant segment and have a 7.5% compounded sales growth projected through 2006 (Technomics -2002 top 100). A proven, leadership concept with almost 200 locations has opportunity for growth to 3000 locations in North America alone, "ground floor opportunity." Superior food and locations are making Charley's recognizable across the country. What does Charley's Grilled Subs™ look for in a franchisee? There are nearly 300 Charley's franchise units Worldwide. We have locations in 38 U.S. states, Guam, Puerto Rico, Ontario Canada, and internationally in countries such as Japan, Korea, Germany, Italy, Great Britain, Kuwait, and UAE. What about financing? Does Charley's offer financing? Charley's does not offer financing. There is a one-time franchise fee of $19,500 for a single unit. For Market Development agreements the fee is $10,000 for each additional unit. Once I am approved how long does it take to open my store? The specific location and existing build-out condition will vary significantly and consequently the time to open. Opening could be as quickly as 60 days from signing a franchise agreement. Typically it will take six to eight months from the signing of your franchise agreement to celebrating your opening day. Our training for up to three people per location is comprehensive and includes 4 weeks of time prior to opening. Our opening support helps to create a successful business launch.